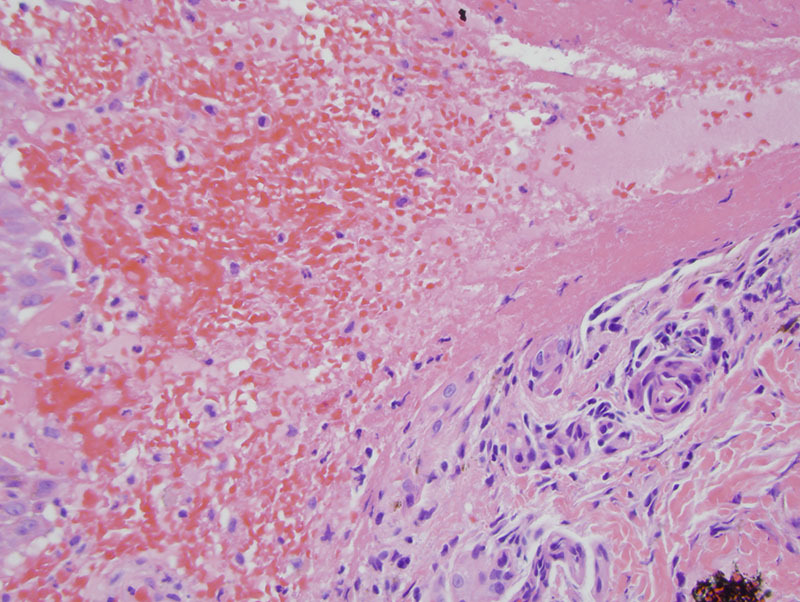 The findings are those of a subepidermal bulla filled with fibrin, red blood cells and a few inflammatory cells in association with a granulation tissue-like pattern of neovascularization within the dermis accompanied by hemorrhage in the absence of any evidence of autoimmune vesiculobullous disorder. This particular histomorphology and negative indirect and direct immunofluorescent profile corresponds clinically to small hemorrhagic bulla. The patient apparently has a history of angina bullosa hemorrhagicum. This entity appears as tense dark red to purple blood filled blisters that usually involves the oral cavity and esophagus. They are of spontaneous onset or can be related to minor trauma. This condition is not attributable to a blood dyscrasia, an autoimmune vesicular bullous disorder or a true vasculitis. Risk factors include diabetes mellitus, chronic kidney injury, asthma, rheumatoid arthritis, gastrointestinal disturbances, hyperuricemia and systemic lupus erythematosus. There is no evidence of a coagulation abnormality. 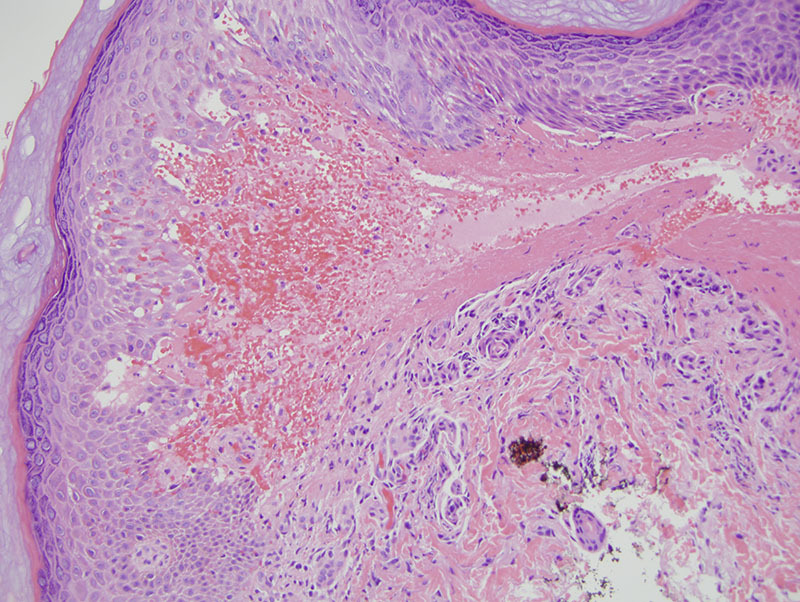 The histopathology in the oral cavity is a subepithelial blister containing a few inflammatory cells and red blood cells along with fibrin. Direct immunofluorescent studies as noted here are usually negative. Avoidance of external trauma appears to be key in the treatment of angina bullosa hemorrhagicum. When one reviews the literature on angina bullosa hemorrhagica it is limited. There are less than 50 papers, with the first paper appearing in 1985 with more or less all of the reports being in the oropharyngeal cavity. 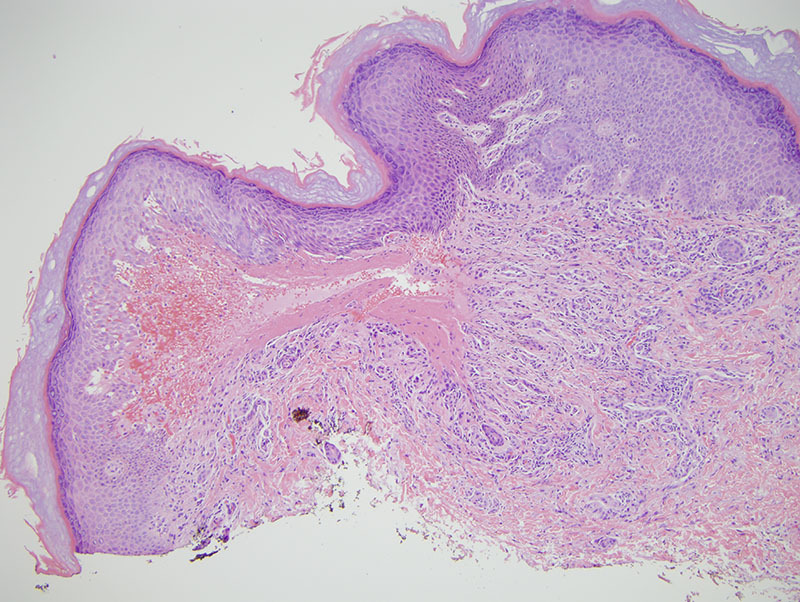 There are no reports of this condition involving the skin, but there is no question that the clinical presentation along with a light microscopy is indistinguishable from what has been described in the oral cavity and in this regard we simply must accept the process to be angina bullosa hemorrhagica involving the skin.